Qingming Shanghe Tu (Along the River During the Qingming Festival) – is a painting by Song dynasty artist Zhang Zeduan (1085 –1145). It captures the daily life of people and the landscape of the capital, Bianjing (present-day Kaifeng) during the Northern Song. The theme is often said to celebrate the festive spirit and worldly commotion at the Qingming Festival, rather than the holiday’s ceremonial aspects, such as tomb sweeping and prayers. Successive scenes reveal the lifestyle of all levels of the society from rich to poor as well as different economic activities in rural areas and the city, and offer glimpses of period clothing and architecture. The painting is considered to be the most renowned work among all Chinese paintings. As a class project, students were required to research and study this famous painting and sketch replicate at least five items they saw in the painting. 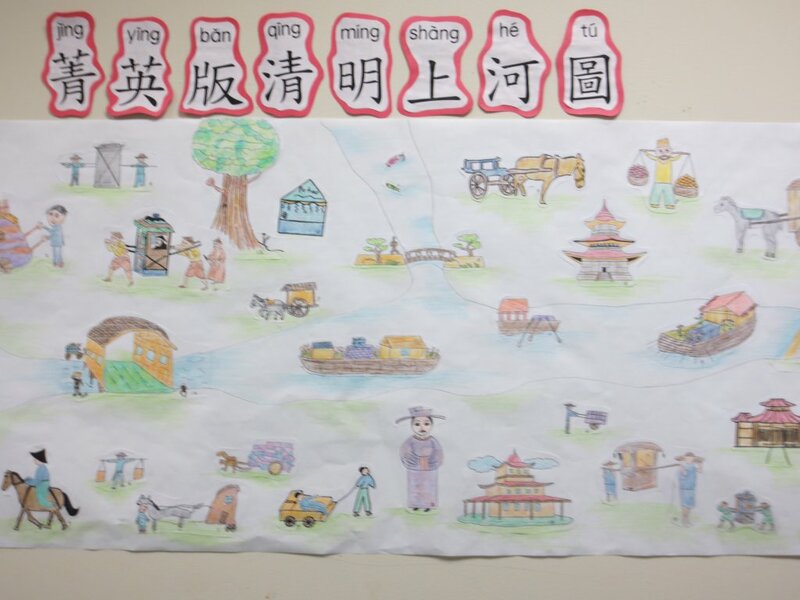 The students’ artworks have been combined to form their own Qingming Shanghe Tu.